A burger, stacked high with meat, cheese, lettuce, tomato and all the condiments your heart desires, is an all-American tradition. In New Mexico, you’ll find all the classics, but you’ll also find burgers with some true New Mexican flair. Here are the 10 best spots in the state where chefs have taken burger flipping to new heights, creating their own new traditions with this iconic food. The burgers here are made to order—fresh premium beef patties, never frozen. This small mom-and-pop joint has been flipping burgers since 1999 and is regularly in the “Best of the Best” lists. Portions are big. Burgers come in one-half and pound size with a large selection of add-ons including standards like bacon and cheese and southwest flavors that include jalapeño and jalapeño bacon and the definitive flavor, green chili. This place is as much a burger joint as it is a roadside attraction. Look for the giant burger boy and girl figures on the roof or any of the other giant people and animal statuettes scattered around. On to the burgers. The Hatch green chile cheeseburger was named one of the “10 Best in New Mexico” by the USA Today Readers’ Choice awards. Every burger begins with green chiles and are topped with everything from cheese to bacon to smoked pulled pork. Locally-sourced ingredients are used exclusively in the chile. Don’t miss the green chile shake. It’s a given that a burger joint in New Mexico needs to have a green chile burger on its menu. This place does and it’s an award-winning one. Burgers are made from fresh-ground whole boneless chuck and sirloin, hand-formed and are served on a homemade brioche bun—gluten free available upon request. Of course, Hatch green chiles, roasted, peeled and diced are used in the sauce. Simple, fresh homemade potato chips are the standard side. Make a green chile meal of it by adding green chile cheese home fries and a green chile shake. Enjoy a meal on the patio weather permitting. What you come here for is the Buckhorn green chile cheeseburger. Since 1944, this little spot off Interstate 25 has been cooking up top-quality food that’s been featured in mag-azines and on television. The Buckhorn burger came out on top at Bobby Flay’s legendary “Throwdown.” Nothing is pre-made and everything is cooked fresh. All burgers come with lettuce, tomatoes, pickles, onions and mustard. If green chile isn’t your thing try the tortilla burger or the Buckhorn taco burgers. The flat top grill in this tiny superette sizzles from early morning to late night with made-to-order fresh all-beef half-pound burgers. Located off Interstate 40 near the Laguna Pueblo, it’s on the green chile cheeseburger trail, a definitive route that showcases the State’s culinary work of art. Cooking methods are kept secret, but this burger is the per-fect blend of meat, cheese, chile and lettuce, tomatoes, onions, pickles and mustard, all on a fresh sesame seed bun. If you’re looking for something spicy skip over the green chile burger and go right to the fiery ghost pepper burger, so hot you’ll be glad a drink comes with the full meal. Burgers are made with Angus beef that comes from humanely-raised cows, a fact owners proudly promote. Also on the menu are some not-so-hot burgers that include a Hawaiian, av-ocado cheese, bacon cheddar mushroom Swiss and blue cheese bacon. What would a burger be without fries—add an order of beer batter or parmesan cheese fries so you don’t have to find out. You’ll find a good old-fashioned burger at this tiny, nondescript restaurant. Don’t let the outside look fool you, the owners have mastered cooking burgers. You can get one, two or three or the Big Mike XL, six patties on one bun. All come with a choice of onions, jal-apeños, green chile, bell pepper, mushrooms, guacamole, bacon and American or Swiss cheese. Locally-owned and family operated since 1982, this is a true family based business that prides itself on making sure diners are treated … like family. It’s an old-school diner that serves really good comfort food, with burgers at the top of the list. All one-third pound patties are made with 100 percent fresh ground beef. Get your favorite cheese or chili cheese or double-meat or even double-meat green chile cheeseburger. Looking for something different try the Buffalo burger. If meet isn’t your thing, there’s a garden burger, too. Second Sunday of each month is pie day … green chile apple pie is a must. What’s better than a classic flame-broiled hamburger and fry combination meal? Not much. That’s what you’ll find at this Las Cruces mainstay, no-frills food that is just good and has been for more than 30 years. Single, double, triple patty options come with cheese, lettuce and tomatoes, and if you’re in the mood, green chile sauce. Fresh ingre-dients, a toasted bun and hand-cut French fries all help to make this a meal you’ll come back to again-and-again. Red chile on a cheeseburger in a state that has a green chile cheeseburger trail? Yes. What a delightful change-of-pace. 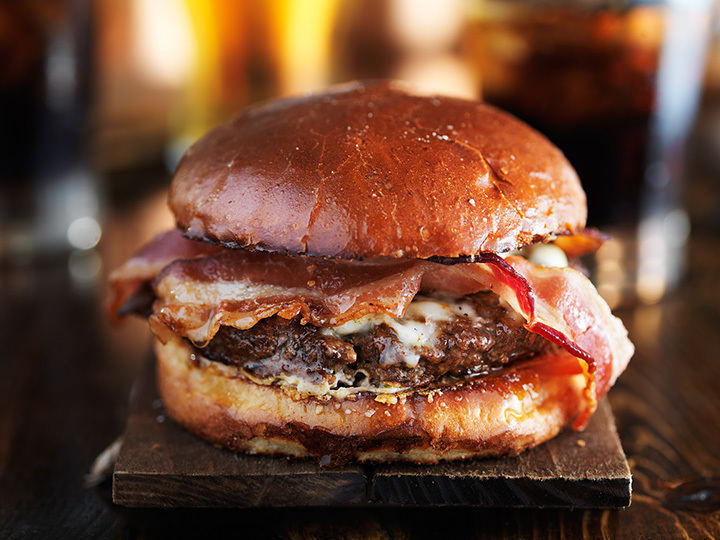 Burgers are hand-pressed and cooked-to-order. The Little Red, the namesake burger, comes with lettuce and red chile only in one-quarter or half-pound sizes on a toasted bun; if you’re really hungry try the double red chile combo with fries and a drink. You can, of course, get green chile, too. Both red and green chiles are locally-sourced.